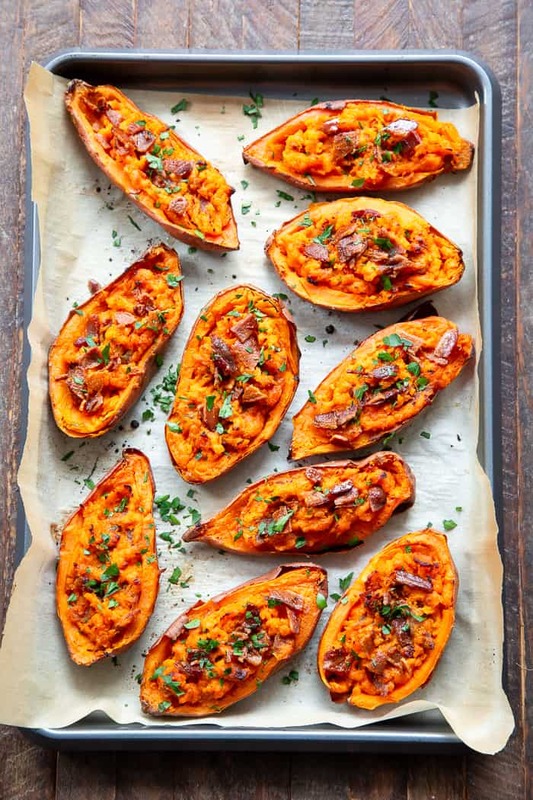 We’re taking sweet potatoes to a new level today with these spicy loaded buffalo sweet potato skins! The skins are baked until crisp and then loaded with the most delicious filling. One bite and you’ll be addicted! Perfect appetizer or fun side dish that just happens to be Whole30 compliant. 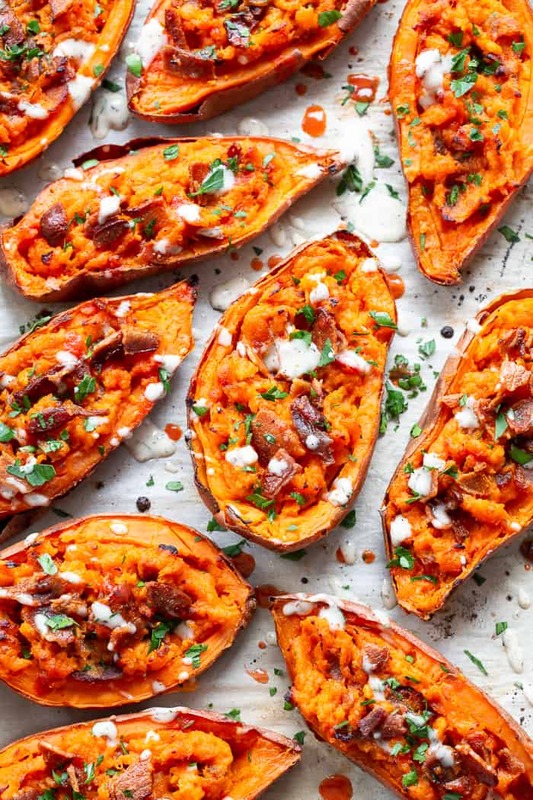 I’d been planning to make sweet potato skins all month with the Super Bowl in mind, but honestly didn’t feel all that inspired. I have an awesome recipe for crispy loaded white potato skins snd wanted to do something completely different! But not much was coming to me. Besides bacon, that is. 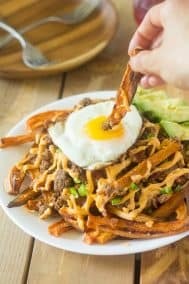 I knew I had to include bacon in whatever mix I decided to create! 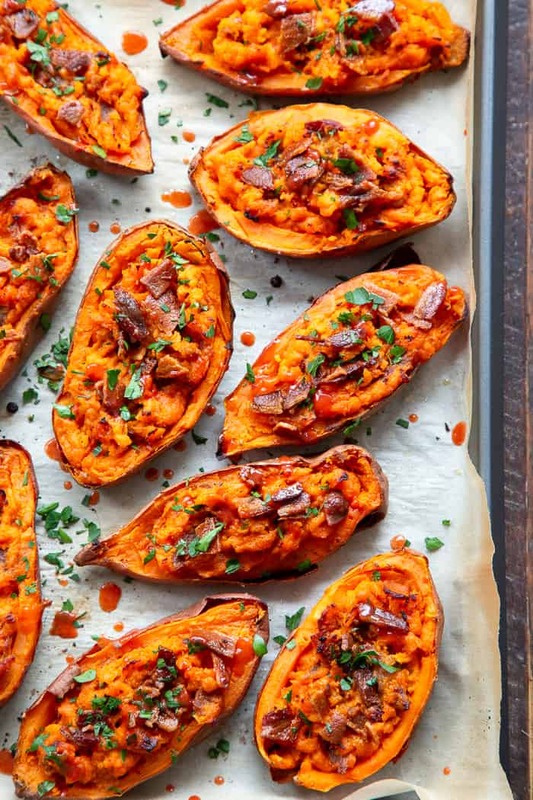 Other than the bacon, I was completely drawing a blank on how to make these sweet potato skins special. And then randomly, it hit me – spicy buffalo! Hot sauce compliments sweet potatoes so well as probably many of you know. 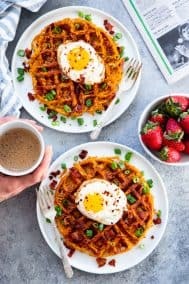 I mean, who doesn’t love a drizzle of hot sauce on a sweet potato hash? The flavor is awesome, to say the least. 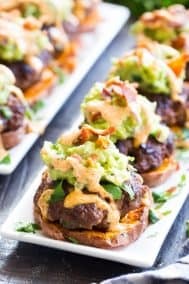 So I knew I had to go with it – spicy buffalo loaded sweet potato skins! We’re taking out the insides of the sweet potatoes and mixing them with hot sauce, ghee, (or coconut oil if preferred), dairy free milk for creaminess, and spices for flavor. 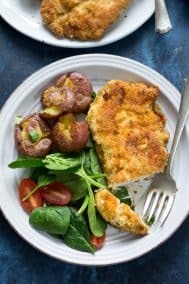 You have the option of including some nutritional yeast for a “cheesy” flavor. Oh and the bacon. How could I forget?! The skins themselves are baked until crisp, then loaded up with the filling plus more bacon and baked again to crisp up more. Then, more bacon is sprinkled over everything along with additional hot sauce and a drizzle of ranch if that’s your thing. 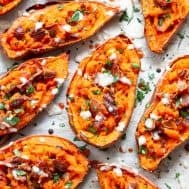 The result is seriously the yummiest sweet potato skin I can imagine! 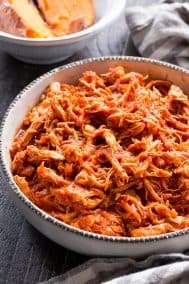 Sweet and spicy, packed with flavor and loaded up with bacon. It’s just perfect! I’ve been eating these for lunch but they’re obviously perfect to serve as an appetizer or a FUN side dish. They’re easy to reheat (sans the ranch) so making ahead of time is also an option! 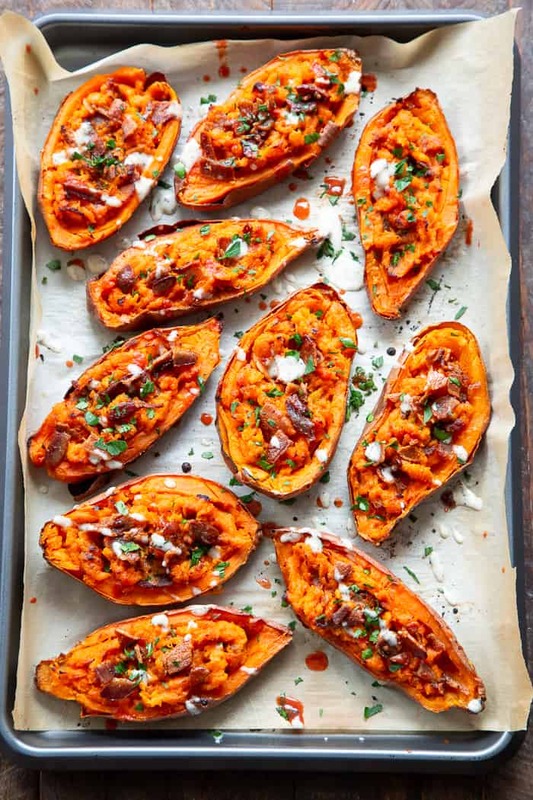 Whether it’s the official “game day” for you or not – your food game will be STRONG with these crispy, spicy, buffalo loaded sweet potato skins! 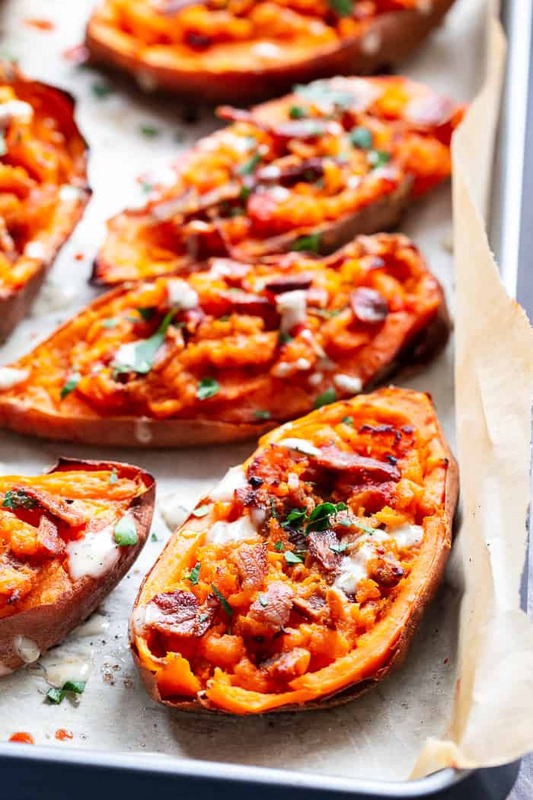 Grab some hot sauce, bacon, and those sweet potatoes (of course) and let’s make this happen! 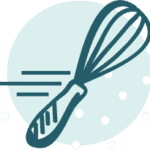 Scrub your sweet potatoes and dry well, then coat each one with a thin layer of coconut oil using your hands. Sprinkle each one with a bit of salt all around and bake in the preheated oven 45-55 minutes until soft on the inside and crisp outside. While the potatoes bake, cook and crumble your bacon and prepare the other ingredients. Once potatoes are done, allow them to sit until cool enough to handle, then cut each one in half all the way around lengthwise. Scoop out the inside of each potato into a bowl, leaving 1/4” layer inside of the skin. Using a pastry brush, coat inside of each potato skin with ghee, bacon fat, or coconut oil (thin layer) and sprinkle with a bit of salt. 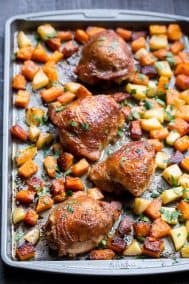 Place face up on the same baking sheet and return to oven to bake 5 mins, then flip them (face down) and bake for another 5 minutes or until both sides are crisp. Mash the sweet potatoes in the bowl with the ghee, dairy-free milk, mustard, hot sauce, nutritional yeast, onion, garlic, salt and pepper. Adjust any seasonings to taste, then stir in half of the crumbled bacon. 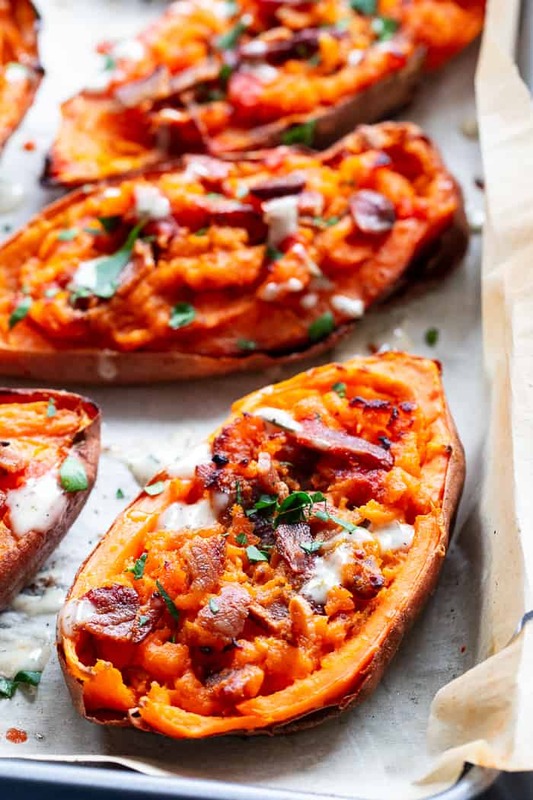 Spoon the mixture into the baked sweet potato skins and return to the oven for another 10 mins to heat through. Remove, then sprinkle on the rest of the bacon, fresh herbs or green onion, and additional hot sauce if desired. You can also serve with hot sauce and ranch on the side. Serve right away and enjoy! Makes 10 appetizer servings. Want More Paleo Appetizer Recipes? Try One of These! 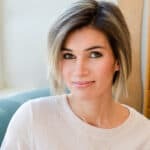 You are one of my favorite food bloggers, and I know that as a blogger you make your money through the ads on your site, but this is getting ridiculous. There are so many revolving ads, pop up ads, and video ads that the page takes forever to load, which makes the eternal scrolling to actually get to the recipe even more frustrating. 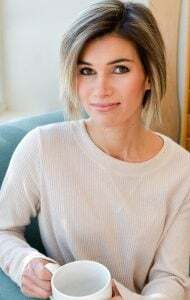 I have noticed this is a trend with most of my favorite food bloggers, and it makes me sad because I am not willing to endure the frustration of the slow load time and navigating around all the adds to access the recipe. I’m not sure what all of these extra ads are going to gain you if you start losing readers. How to choose fresh bacon and meat? Are there any tips? 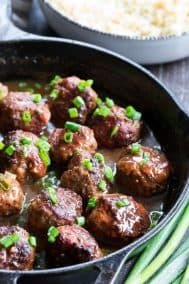 I’m a beginner – just started my cooking adventures, cause my wife is bust with her freelancer’s career and writing site so she has a lot to do. And me – what can I say? I’m an engineer with more than 8 years experience and I’m a tech geek.